The second day of Bharat bandh called by trade union organisations supported by left parties and the Congress turned violent as miscreants damaged 46 buses forcing BMTC to shut operations. Bengaluru: The second day of nationwide agitation called by trade unions turned violent as miscreant pelted stones and damaged buses. According to BMTC officials, 46 buses including 18 Volvo buses were damaged. Buses that were pressed into operation last evening suffered casualties. "Two miscreants wearing monkey caps standing on a divider pelted stones. The bus at Kasturi Nagar Ring Road was damaged. In another incident, a BMTC Volvo bus driver suffered injuries. Driver Ajit Hulimani and has been admitted to Minto Eye hospital for treatment. 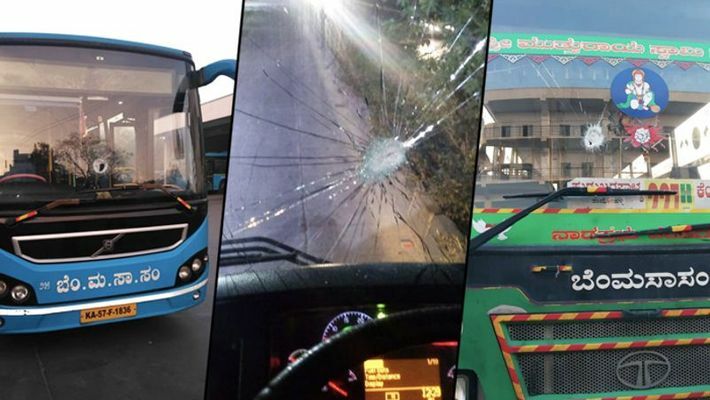 Following an increase in vandalism, our Managing Director of BMTC directed to stop services. At 7:30 am, all the affected zones were instructed to stop BMTC operation, said an official. As the potential to target Volvo buses are high, BMTC decided to cease its services to Bengaluru Airport. All buses heading to Bengaluru Airport from Electronic City, Shanthinagar, HAL, Mysuru Road, Whitefield, Kadugodi, Marathahalli, Indiranagar and Yelahanka have stopped operating. Officials say the BMTC will assess the situation by lunch hour (1pm) and then take a call on resuming its services. An approximate loss of Rs 3 crore was reported on Tuesday with the limited supply of buses that were operational.